Trivandrum Sanskrit Series (Anantasayana Samskrita Granthavali) is a collection of ancient, very rare and previously unpublished Sanskrit works published by Manuscripts Library, Trivandrum in the early part of 20th century. First book in Trivandrum Sanskrit Series – “Daivam”, a work on Sanskrit grammar, was published in 1905 edited by MM T. Ganapati Sastri. Nearly 100 texts were published within a short span of 20 years and the series continues to this day. An article on Trivandrum Sanskrit Series written by G Harihara Sastri that appeared in Indian Historical Quarterly Volume 1 in 1925 describes the genesis and growth of this series and also evaluates the unique contributions of this series to the growth of Indological studies. Namaste! If you come across any of the missing volumes of Trivandrum Sanskrit Series in electronic format or in printed form, please inform me by commenting below this post. I have Part I of Balakrida – a scan ofthe reprint of Anantashayana volume by Munshiram Manoharlal. Let me know if you need this. Also have the Prapanchahridayam or rather a reprint of this volume by Ramlal Kapoor Trust. Thank you very much for your support. I have sent you a mail about this. Years ago I made a high quality photocopy of TSS-089 Sphotasiddhi (Vyakarana) of Bharatamisra from the University of California library. I can scan this and email it to you. Just let me know where to send it. Thank you for making all these rare texts available. Thank you very much for offering to send pdf of Sphotasiddhi. I have sent you a mail. Please send pdf of Sphotasiddhi to me at that mail address. Panchartha Bhashya of Kaundinya on Pasupatha Sutras was published in this series. If it is available even in hardcopy. Please let me know. Thanks in advance. Pasupata Sutras, TSS edition, is available at Digital Library of India at the following link. 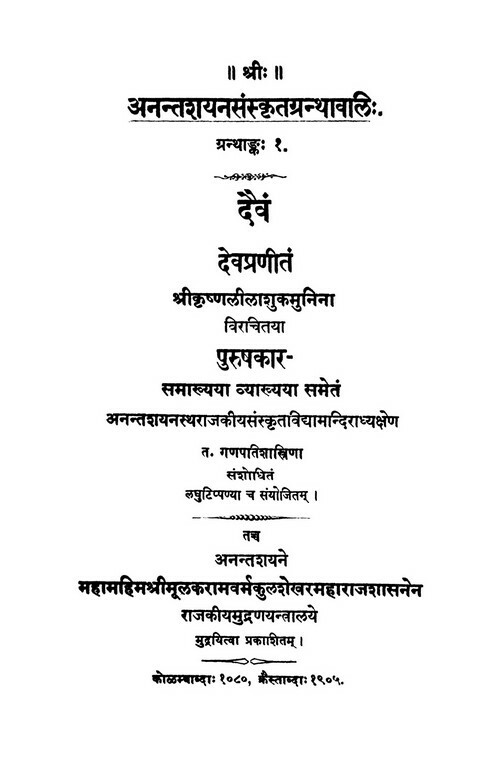 Trivandrum Sanskrit Series No.143,Pasupata Sutras., 4990010048004. Sastri,R.Ananthakrishna,Ed.. 1940. sanskrit. Religion. 190 pgs. Extremely wonderful job for the preservation of great classics. Pray that you also succeed in getting hold of the rest of the few volumes. Out of 20 missing volumes, I got 12 in last 2 days. I will post them to the blog in a day or two. I hope to get hold of the remaining 8 volumes also very soon. I’ve ईश्वरप्रतिपत्तिप्रकाशः and I’ll share it with you soon. Thanks a lot Shankar Ji ! Glad to hear from you after long time. Thank you very much for providing info about Brhaddesi and Dattilam. I got them. Maharthamanjari available at muktabodha site is not from TSS. I have rectified the link to ‘Dattilam’. Thanks for pointing out the error. This is very nice effort. Thanks for your great service to knowledge seekers. Glad to hear from you after a long time. Thanks a lot for my humble efforts in presenting TSS eBooks here. All of us have to thank Digital Library of India for digitizing the rare and old editions of these books. BTW the link to Rajanaka Ruyyaka’s Alankara Sutra is malformed — it seems you have copy-pasted a URL twice. Please fix it. Thanks for pointing out the error in the link to Alankara Sutra. I have corrected it. Got laghustavI with TIkA of rAghavAnanda. Though, failed to locate IshvarapratipattiprakAshaH in library. The library from where I got it, lacks catalog, etc. So, manual checking is need. Though, I’ve typed copy of the same. It would be ideal to post only TSS editions of the texts here. Please share laghustavi pdf with me if it is TSS edition. Took snaps of laghustavI today. will try to make it’s size small. IshvarapratipattiprakAshaH was found later. will be able to get it with in a few days. I think I saw vedAntaparibhAShA with commentary of peddAdIxita to. Will confirm within a few days. Glad to know that you got Isvarapratipattiprakasa. Look forward to its scan and also news about Vedanta Paribhasha. Thanks a lot for all the support. Thanks.Good Job.In future will there be any other collection like chowkhamba etc. Thank you for visiting this blog and for your interest in Sanskrit books. I have not decided anything about next post. Chaukhamba has several sets of books running into more than a thousand titles. It must be very difficult or even impossible to get hold of all those books. Moreover, specialty of Kavyamala and TSS is that most of the books were previously unpublished works published for the first time. This may not be the case with Chaukhamba. Good news! Will it be possible for you to get it scanned or photocopied? Please let me know. No ! But, I can take pictures with a camera and then tailor it. It will take time though. That will be sufficient. Thank you. Added the following titles today. My sincere that to Sri Lalitalalitaji who provided scanned images of these 3 books of Trivandrum Sanskrit Series. These rare books are really great ! I would like to congratulate for your work. Dhanyawaad !! Please note that archive.org has a very good collection of Sanskrit books. I am glad that you liked this post. Thanks a lot for your kind words of appreciation of my humble efforts. The following titles are newly added today. My sincere thanks to Mr. David Reigle for sharing pdf of Spotasiddhi with all of us. item 86 i.e. bharatacharitra of srikrishna kavi link isn’t working. will you please look into this? I have rectified the link. You can download the book now. Thanks for informing about the error. IF SOMEONE CAN HELP ME TO GET KERALIYA SHANKARA VIJAYA & VYSACHALIYA SHANKARA VIJAYA IN PDF I WOULD BE VERY GRATEFUL.I PRAY GOD THIS NOBLE SERVICE TO CONTINUE FOR EVER . Vyasachala’s Sankaravijaya is available at DLI. Link is given below. I could not locate Keraliya Sankara Vijaya. Sankaravijaya., 2020010007423. Vyasacala. 1954. SANSKRIT. . 254 pgs. Thanks a lot. I downloaded Shankara Vijaya by Vyasachala. It is already there on this page – See TSS 91. उतकृष्टं कार्यं कुर्वन्त्यत्रभवन्तः संस्कृतस्य प्रचाराय प्रसारायश्च. प्रार्थे देवीं शारदां प्रदानाय दीर्घजीवनं कार्यकारिणी शक्तिश्च कृते युष्माकम् ……. katipayapustknam tu shrutam aseet parantu katipayapustakanam tu na shrutam . suchnasanjaladeb avagatam. itah eva maya katipayani pustakalni pathitani, pathan asmi cha .samskrita sahitye prasidhhani cha pustakani santi atra . tesham sanklanam pathanam cha mahattvapurnam asti. pranamastu tava sevaaya mama mitra. ahan srilanka desawaasee bawddha bhikshu asmi. krutopakaram tava evam prakasayishyaami. swasti siddham. It could be available in some old libraries. kindly give me information about a book name SUPADMA VYAKARAN on sanskrit linguistic.. If you are looking for ebook of Supadma Vyakaranam by Padmanabhadutta, it is available at Digital Library of India. Its Barcode and other details are given below. Supadma Byakaranam(1937)., 4990010055118. N. A.. 1937. sanskrit. Language. 1016 pgs. I RESEARCH ON VADHUL SMRITI. I WANT ANY RESORCE OF IT. PLEASE GIVE ME ANY LINK ABOUT VADHUL SMRITI SUCH AS E-BOOK, PDF, MAGAZINE, PUBLISER REFERANCE ETC. You will find Sanskrit text of Vadhula Smriti in volume 6 of Smriti Sandarbha published in Gurumandal Series, Calcutta. It was later reprinted by Nag Publishers, Delhi. It is also available online at Digital Library of India. Details are given below. The Smriti Sandarbha Vol-VI No-IX (1957)., 99999990822763. Maharshies.. 1957. english. . 431 pgs. ABOUT ONE YEAR AGO I HAVE ASKED FOR PUBLICATION OF VADHUL SMRITI FOR M. PHIL. RESEARCH. NOW I AM JUST ABOUT TO COMPLETE IT. BUT I WATN THE INFORMATION OF THE MANUSCRIPTS OF VADHUL SMRITI ALL OVER INDIA. PLEASE GIVE ME THE DETAILS OF IT OR THE SOURCE OF I.
Hemal, The following article contains details of a critical edition of Vadhula Smriti published from Hoshiarpur. Details of manuscripts should be there in this book. You may try to find it in your University library or other public library. i am a atharva veda pandit and i am looking for books…. I’m in search of #134 of TSS (yoga yajnavalkya). I am also in search of TSS 134 Yogayajnyavalkya samhita. Kindly help. I want to down load Siddhantakaumudi(sanja & paribhasa)notebased answer in simple sanskrit. Sarmaji, Do you have them in pdf format? If so please up the files to archive.org for the benefit of all. I am a traditional shukla yajurvedas brahmain would like to request you to that I wish to download the oldest print of Shuklayajurveda samhita. Please send me reply in this regard on my email address. Kashikar, It is not easy to determine which is the earliest edition of Sukla Yajurveda Samhita. If you can tell me the name of publisher, year of publication, etc, I will try to help you to locate it. But for many years I’m searching for any sanskrit language based go shastra. ..
study of cow in sanskrit literature., 99999990041485. sharma, b.v.v.s.r.. 1980. english. tribes, india. 302 pgs. Go Gyan Kosh Prachin Vaidik Vibhag Bhag-2., 99999990311526. Satvalekar, Pandit Shripad Damodar. 1955. hindi. Literature. 240 pgs. Thank you very much. I will add this to TSS page. It would go a long way in having a catalogue of your publications arranged year-wise and subject-wise, if you have not done it so far. Ganapati Hire, I have not come across Prayogamanjari on the internet. I will let you know, if I find it. It is jut a wonderful collection. I am searching for raja ravi varma’s purnatrayishasataka. Please kindly help on this. I have not come across ‘Purnatrayisa Satakam’ on the internet. If you are in Kerala, you would be able to get is photocopy from Sanskrit College Library at Trippunithura. Meanwhile, I will let you know if I happen to get its soft copy from some other source. Thank you sir . But i am not from kerala am from bangalore. Please find the soft copy if its possible. Thanks. Sujith, Mahanayaprakasha edited by K Sambasiva Sastri is available at Digital Library of India. See details below. Mahanay prakash Granthank-130 Shri citrodayanajari XIX., 99999990292048. XXXX. 1937. sanskrit. Devotional. 83 pgs. Mahanay prakash Granthank-130 Shri citrodayanajari XIX., 99999990320239. XXXX. 1937. sanskrit. Devotional. 83 pgs. I came across 3 Dandakas on Sundari, Dhumavati and Matangi in the Monthly Samskrita Pratibha(published by Sahitya Academy) many years ago(maybe 1987), attributed to Ananda Jha and the work is supposed to be Aananda Madhu Mandaakini, and has 10 Dandakas, on all Dasha Maha Vidyas. If you could kindly inform where it can be got, or better a softcopy provided, I will be much grateful. This is Navarathri time. I am a Professor of Mathematics at NITK, Surathkal, Mangalore. Thanks in advance. Dr Shankar, I don’t have this book. I will look for it and let you know if I find it. When i was searching in google i saw trivendrum sanskrit series are available if you have please give me i am ready to pay i can’t understand any other lauguages only sanskrit i can understand please help me. Just right-click on the titles and then save them to your computer. Shrinath Udupa, I didn’t mean that Angirasa Kalpa is available on this page. I thought you are looking for books of Trivandrum Sanskrit Series. Please have a look at “Atharva Veda Parisishta” at the following links. It contains Anvitartha Prakasika Tika also. But, this may not be available for all Skandhas. You may have to check it. It is said in the introduction of part 2 that part 1 was published in 1940 by Director of Ayurveda, Trivandrum (This was published in a different series named Sri Chitra Ayurveda Series). I am unable to locate this volume anywhere on the internet. Dli इत्यत्र संपूर्णं ग्रन्थं स्वीकर्तुं कः विधि? No. 112 – कुचेलोपाख्यानम् अजामिलोपाख्यानं च. Kucelopakhyana and Ājamilopakhyana (Saṅgīta) by H. H. Svāti śrī Rāma Varma Mahārāja. No. 113 – सङ्गीतकृतयः Sangitakrtis (Gāna) by H. H. Svāti Śrī Rāma Varma Mahārāja. No. 118 – बालरामभरतम् Balaramabharata (Nāṭya) by Bālarāma Varma Vanci Māhāraja. No. 122 – प्रबोधचन्द्रोदयम् Prabodhacandrodaya (Nāṭaka) by Kṛśṇamiśrayati with the commentary Nāṭakaābharaṇa Śrī Govindāmṛtabhagavān. No. 123 – सङ्ग्रामविजयोदयः Sangramavijayodaya (Jyotiṣa). No. 130 – महानयप्रकाशः Mahanayaprakasa (Vedānta) by Abhinavaguptācārya. Jaya Prakash, More than 260 titles have been published in Trivandrum Sanskrit Series. Out of this Digital Library of India has more than 150 titles. I stopped with 111th title since these titles were in the open domain as per US copyright laws (books published before 1923 do not come under copyright). In the case of later books, the copyright is valid for 60 years after the demise of the scholar who edited the text. So, we cannot easily know whether a book published after 1923 is in open domain or not, unless we know the year of demise of the scholar who edited the book. No. 135 – सर्वदर्शनकौमुदी Sarvadarsanakaumudi by Mādhavasarasvatī. No. 138 – आर्श्वलायनगृह्यमन्त्रव्याख्या Āsvalayanagṛhyamantravyakhya of Haradattamiśra. Jayaprakash, Trivandrum Sanskrit Series continues to this day. I remember seeing TSS-268 Madanadi Nighantu published in 2005. Trivandrum Sanskrit Series No.CXLI., 5990010905197. K Sambasiva Sastri. 1938. sanskrit. Null. 396 pgs. Trivandrum Sanskrit Series No.XVIII., 5990010905198. T. Ganapati Sastri. 1912. sanskrit. Null. 391 pgs. Trivsndrum Sanskrit Series,Agnivesyagrhyasutra., 4990010048005. Varma,L.A.Ravi ed.. 1940. sanskrit. Religion. 230 pgs. I have started Ph. d. in apastamb grihya sootra. With that have taken manu-script of it. I want the information of manu-script available all over India. From where I can get the information or list of it. I had tried a lot on namami vebsite, but it is unable to open. In Octomber 2015 I have called also to given number in namami vebsite, they told that it would be able to open in December, but still it is not opening. I also want the details of published books of Aapastmab gruhya sootra all over in India. I had tried a lot on namami website, but it is unable to open. In Octomber 2015 I have called also to given number in namami vebsite, they told that it would be able to open in December, but still it is not opening. please add sidhanta siromani . From where I can download Prakriya sarvasvam .I have first 4 parts of it.I want to download its remaining parts. Parts 5 to 7 of Prakriya Sarvasvam were published by Kerala University. I haven’t come across their digital copies on the internet. You may have to access them from libraries or get hard copies from the publisher. Giving below the contact details of publication department of Kerala University. Please help me find SUKTI RATNAKAR. I could not find Brihad Durgarchana Paddhati anywhere on the internet. You may have to access it from a library or purchase a copy of the book. The “Narayaneeyam” with Bhaktapriya Commentary Of Desamangala Varya .pdf doesn’t have the 100th dasakam and the 99th dasakam is incomplete. Can I get the complete text in hard copy or in soft copy? Arya, Thanks for pointing out the missing pages. I have uploaded a complete scan of Narayaniyam with Bhaktapriya commentary. You can download it from the following link. Does anyone know where I can find the buy or download the following book in devanagri script – Krsniya / Krsniyam? Justin, I think this book is not available on the internet, at least I have not seen it anywhere. You can order the book directly from the publishers. Thanks! But that email address doesn’t respond. I wrote to the same email about Krsniyam back in 2012. Anyone in Thiruvanathapuram who can help me obtain this book? Do you have ‘Aryabhatiya with the bhashya of Nilkantha somayaji’? I read in research papers that it was published by ‘Trivendram sanskrit series’ in 1930 and was edited by K.Sambsiva sastri. do you have a copy of Madanaketucarita by Ramapanivada (TSS 161)? I don’t have it. I will let you know if I get it. Dear Sir, did you manage to find? No, I have not yet found it. I will keep looking for it and let you know if I succeed. Sir,I need to download malayamaruta sanskrit books.please help me. Malayamaruta is a Sanskrit journal published from Tirupati Rashtriya Samskrita Vidyapeetha. It is not available on the internet. You will have to access it from University or public libraries. Sir, downloaded TSS-065 Mayamatam of Mayamuni. Please guide me how I can get it in printed form. I have no idea about its availability in printed form. Please try to contact the publishers. I would like to download the Sanskrit Text by name Citraratnakara of Cakrakavi which is listed as TSS-220 in your series please. TSS-100 I need this book sir. Please help me sir. Please give details of jyotishya manuscripts.’. Giving below links to Trivandrum & Mumbai editions of Yogayajnavalkya. Bahu upayoga pusthakaprashana sahaayaartham bahoopakruthosmi. संस्कृतसाहित्यस्येतिहास: I need it sir. Though there are Samskrita Sahityetihasa by different authors, I have seen only the edition of Hansraj Agarwal on the internet. Links are given below. Given below links to 4 parts. Thank you so much for providing the links to all the 4 parts. We are in the process of creating a memorial for Bodhidharma at Kanchipuram. This is an Indo-Japan project and our aim is to re-create the lost history of Bodhidharma which in its present state has many gaps. His life in China has evidences like stone inscriptions, ancient text references, etc. but the Indian part of his life is still not clear and complete. Kindly let us know if you could support us with any books, references or other material like palm leaf manuscripts, paintings, inscriptions or folklore? Do you have a copy of Avantisundari Katha? I don’t have any information on Indian sources of Bodhidharma.